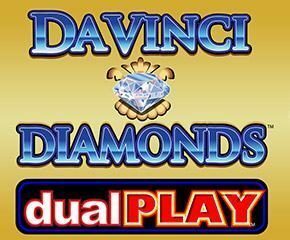 While introducing Da Vinci Diamonds Dual Play slots, it is important to mention that it is again one of the very brilliant ideas of the IGT Developers. They cleverly banked upon the success of the earlier version- Da Vinci Diamonds slots game. 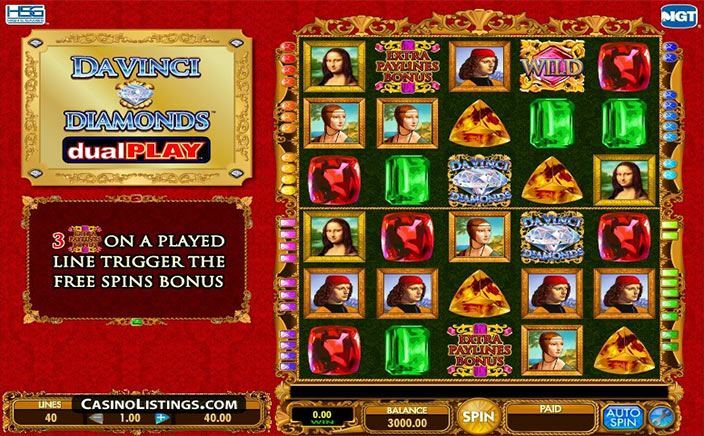 Da Vinci Diamonds Dual Play slots is an exact replica. The only difference is that this time IGT has offered 40 paylines instead of 20 and 2 similar reel sets. The reel sets are placed on top of each other. It itself is interesting to see this rare combination on the reels of the slot. Las Vegas homes one of the world’s famous gaming technology providers, IGT. IGT stands for International Gaming Technology, a company which came into existence in 2006 as GTECH Corporation. Lately, in 2015, GTECH had acquired another gaming company IGT in America and started their functioning in the name of IGT only. Ever since then, the company is creating mind-blowing slot games which are avidly played by the slot lovers day in and day out. Da Vinci Diamonds Dual Play and Da Vinci Diamonds slots are both grabbing unparalleled attention due to their features. There is a ‘Tumble reel’ feature by which reels from the top tumble down to the bottom in the slot. This happens after a winning payline is formed to help in further creating winning paylines for the player. If a winning payline is still not formed, there is the Tumble Thru feature through which any symbols from top rows located above the winning paylines tumble down to earn multiple levelled payouts to the players. Now to earn free spins, the game has an extra payline symbol. You need to get at least 3 of them to earn 6 free spins. Also, the number of paylines to play on an increase from 40 to 60 during this feature. As per the other symbols, there is a Leonardo Da Vinci’s portrait, Mona Lisa symbol which is one of his very famous paintings and diamonds and other gemstones. The jackpot is drawn out by getting 5 Leonardo Diamond symbols combining together to earn the player 5000 coins. Considering the quality and graphics of the IGT games, it would not be unfair to term this company the future of the gaming technology. Da Vinci Diamonds Dual Play slots is indeed wonderful to experience after Da Vinci Diamonds slots have already been able to satisfy casino players with its awesome gameplay. So, it needs not be mentioned that this slot game is worth a try at least once.